Have you seen the printer-style trays by 7 Gypsies? I have had a bit of a thing for printer's trays for quite some time. I used to put little knick knacks and such in them. My husband is not so fond of the knick knacks so I don't have one any more until I saw these at the scrapbook store. I bought one for myself in black with the 12 ATC size openings. 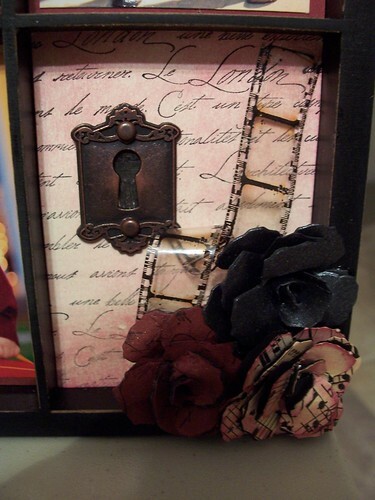 I used a lot of Tim Holtz things on this project. The roses are made by one of his tutorials. There is a really easy to follow version on Splitcoatstampers. I also finally took advantage of some sheet music I just had to have off etsy. I used mostly photos because I thought my (thinks he's a decorator) husband is not fond of this type of thing on the wall but I like it. 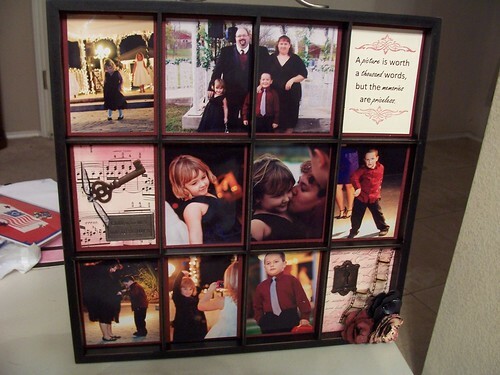 Once I get my own scrapbook room instead of splitting a room with him it will go in there. Until that point he will be tortured. Those are just totally wonderful! And I love the way you divided the group picture. Very special!